Do you need extra help for EL students? Try the Information Gaps and Finding the Area pre-lesson. 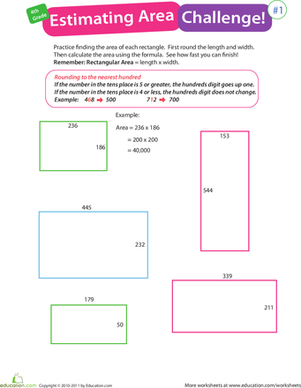 Students will be able to find the area of rectangles and squares. Tell students that today they are going to be interior decorators. Explain to students that they will work with a partner to furnish a room. 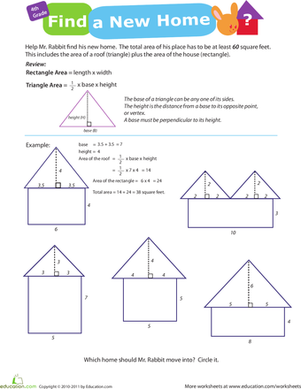 Students will create polygons to furnish a room and be asked to calculate the area for each item. Define the following terms in students' home languages (L1) and in English (L2): "interior decorator," "furnish," "polygon," and "calculate." Provide an image when applicable. Have students talk to a partner regarding their understanding of the meaning of the term "interior decorator" to gather their background knowledge on the concept. Display the sentence stem to guide them as they converse: "An interior decorator's job is to..."
Ask students to review the formula for finding the area of a quadrilateral. Define a quadrilateral as any polygon with four sides. You can explain to them that in geometry, length usually refers to the longest side of a rectangle and width is usually the shortest. Tell them that they are going to “make" several pieces of furniture for their rooms. To make the furniture they have to draw squares and rectangles and determine the area. Ask students to review the formula for finding area: Area = Length x Width. Draw a large rectangle on the board. Choose numbers to determine the size of the "room." Write these on the sides of the rectangle. Together as a class, determine the area of the room that they will be furnishing. Remind students that the answer to an area equation is written in square units. Have students repeat to a partner, the process and answer for the problems you solve in this section (e.g., "To find the area of a piece of furniture or a room, we must multiply the ____ by the ____," and "The area of this room is ____ square units."). Allow students to state the equation in their home language (L1). Create a word bank as you teach of pertinent vocabulary terms that will be used throughout the lesson. Tell students that now they are going to find the area of one piece of furniture that could possibly go in the room. Give students the following information by writing it on the board: Table = 3ft x 4ft. Calculate the area for this table. Model how to cut out a rectangle that is 3 inches by 4 inches. Explain that 1 inch represents 1 foot. Remind students that they must leave space in the room to walk so they must subtract the area of the furniture from the total area of the room to make sure there is enough space. Give students construction paper and a ruler. Remind them that they must draw and label the shapes using the numbers below. They can then use scissors to cut out different shapes and glue them to a larger piece of construction paper. Allow students to work with a partner, preferably one that speaks the same home language, for the Guided Practice work so that they can talk through the problem together. Have students verbally describe the steps they took to find the area of the table and decide on where in the room to place it. Provide sentence stems such as: "I calculated the area of the table by... I decided to place the table here because..."
Students will create "furniture" by creating squares and rectangles. Let them know that they can use the following dimensions to label their shapes: 5ft x 3ft, 3ft x 3ft, 8ft x 5ft. Remind students that 1 inch represents 1 foot. Using the formula for area they can determine what items to put in the room. They will have to add the area of the pieces of furniture and then subtract it from the total area of the room. After furnishing the room the students must show these area calculations. Provide a word/phrase bank of useful geometry terms to help students. Let students work in small groups on this project. Give students access to the vocabulary cards that have images and definitions of keywords for this lesson. Have students repeat the directions to a partner before beginning the work. Provide sentence stems to guide them: "First, I... Then, I... After that, I... Finally I..."
Give students small manipulative blocks to fill in the polygons to find the area. Pre-cut shapes with labeled side lengths can be used. 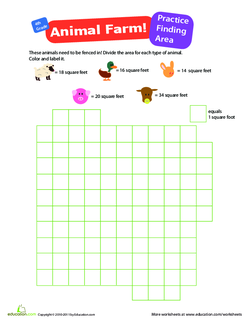 Have students use the Animal Farm Area worksheet to help them become familiar with the idea of calculating area. Allow students to furnish the room using measurements of their choice. Give each piece of furniture a price and have the students estimate the cost to furnish the living room. Hand out an index card to each student. Have them draw a rectangle or square with any dimensions. Have them switch the card with a partner and tell them to solve for the area of the shape their classmate drew. Make sure students write their name on the card they solve. Collect the cards as a formative assessment. Have students talk with their partner as they solve for the area of the rectangle/square. Provide sentence frames such as: "To find the area, I will multiply ____ by ____." 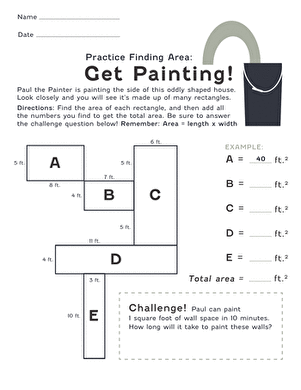 Invite students to repeat the steps necessary to find the area. Give them a chance to discuss any challenges they encountered in the assessment with the sentence stem: "A challenging part for me was..."
Have students share their completed rooms and explain what furniture each shape represents. Remind students that area is the measurement of a surface. Knowing how to calculate area can help in real-world situations when buying rugs and furniture. Have students present their "room" to a partner before sharing out with the whole group. Display a word/phrase bank with important terms that students will need as they present their work. Ensure the bank includes images and symbols to heighten students' comprehension. 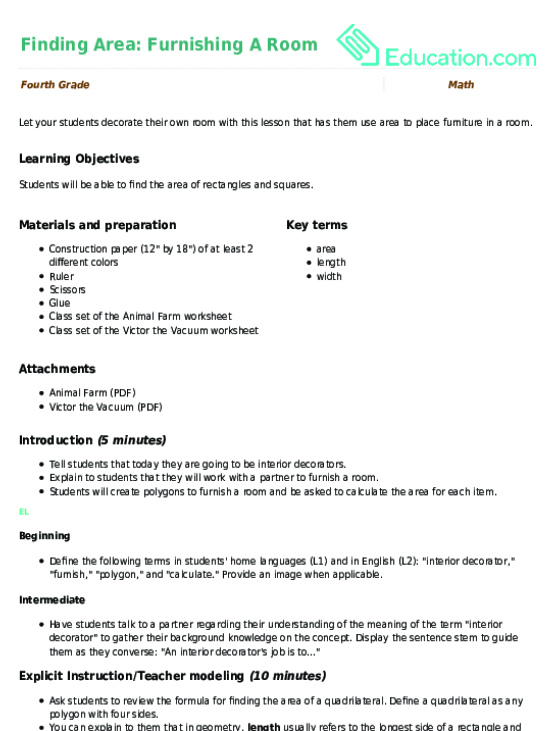 It may be taught by itself or used as support to the lesson Finding Area: Furnishing A Room. 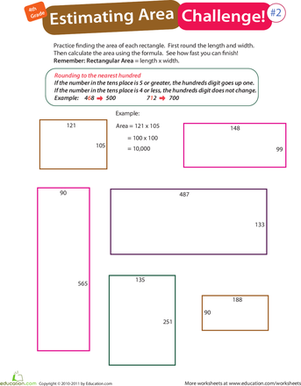 Now your fourth grader can practice with estimation and finding area--in just one printable! 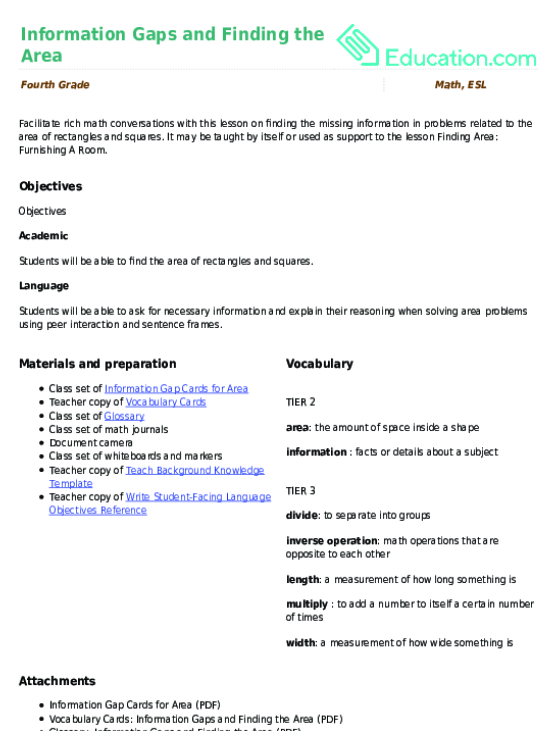 Use this glossary with the EL Support Lesson: Information Gaps and Finding the Area. 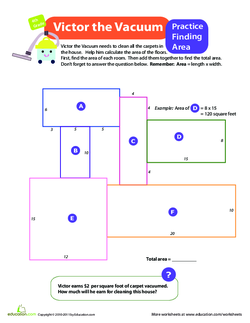 Boost your fourth grader's estimation skills and help them practice finding area with this colorful worksheet. Use these vocabulary cards with the EL Support Lesson: Information Gaps and Finding the Area. 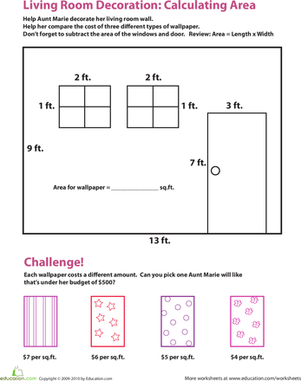 In this 4th grade math worksheet, kids find the area of a wall, then calculate which kind of wallpaper is within budget. Give your fourth grader some entertaining at-home practice finding areas with this challenging worksheet that incorporates the adorable Mr. Rabbit! What Is the Area of Your Classroom? Finding the area of a rectangle is a key measurement skill to know. In this lesson, your students will enjoy practicing this skill by determining the area of their classroom.